I owe my faith to my Savior. I owe my life’s mission and inspiration to a friend and a box. The SONshine Box Ministry began as a way to encourage and uplift a life-long friend with the gift of God’s word. 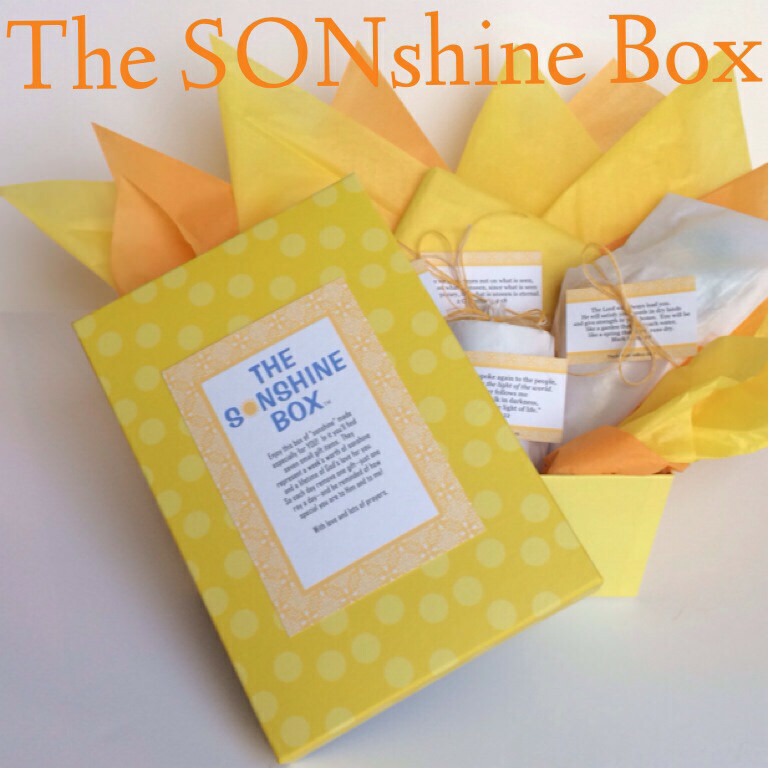 I’d love to share my original post with you that reveals the inspiration of the SONshine Box. And you’d sure bless me and Heaven if you reminisced with me for a minute. 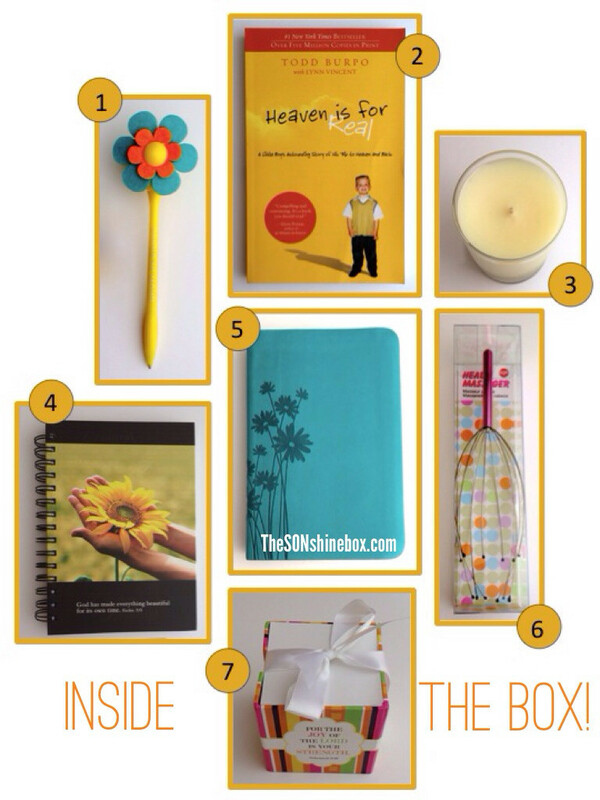 Below it, you’ll find the practical how-to’s and pictures of a SONshine Box. 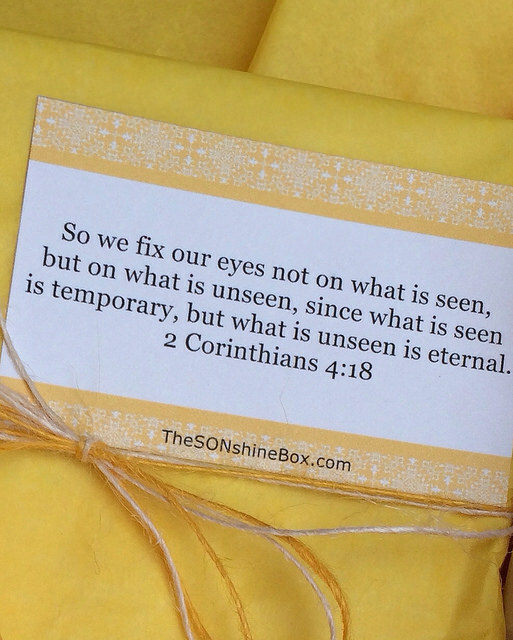 And then you can hop over to the sidebar at the right and easily get your SONshine Box printable to make your own and share encouragement and the gift of God’s love with others. You see, ten years ago TODAY I celebrated the birthday of my best-friend from high school. Less than four months later, she celebrated her first birthday in Heaven—after cancer took her body and Jesus took her home. It left me battered and broken. But by grace—still believing. And I only know God’s Word today and dare to write it because we dove into the deep end of faith together, and came up for air only when we had to. Before I share today’s gift with you, I hope it’s OK that I share a quick memory. I can still hear the shrill sound of the phone ringing, and feel my feet sliding across the floor to answer it. What followed left me out of breath, and nearly out of words. A rarity. “Christie, Missy has cancer,” her mom softly said. My heart dropped into my lap, unable to keep up with the pace of those words. I shifted mental gears into reverse, recalling the childhood years she’d been my secret keeper and the gatekeeper to my heart. She’d also been an answered prayer and a literal life-saver. It was now my turn to return the favor. After one of our last outings, my tires crunched down her gravel driveway, and then settled in for a minute. Before she grasped the door handle I said, “Missy, you KNOW why God created our friendship so many years ago.” She said, “Yeah.” We both knew. And I told her, “For such a time as this!” She nodded and those blue eyes just sparkled back at me. And THAT brings me to the gift. Today. On her birthday. For such a time as this. As a thank you for reading along, I want to gift you with the opportunity to make a SONSHINE BOX. I made my first one for her back then when our closest friend shared how her mom used to make her a cheer-me-up sunshine box when she was a kid. So the two of us got to work making one especially for Missy. And then another. And another. 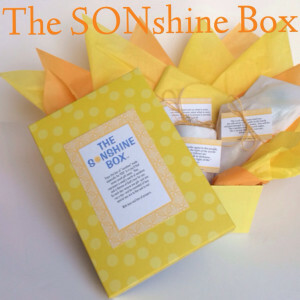 We took the traditional “sunshine box,” and put my cheesy love of themes and words to good use, and the “SONshine Box” was born. A gift box filled with seven wrapped items, wrapped up in love and God’s Word, that also included the condition to only open up just one a day for a week. So she got a box enclosed with a week’s worth of gifts, but filled with a lifetime of God’s love for her. In the decade since, I’ve continued to make countless SONshine boxes for friends and family, and even better, many of them have continued to make their own for those in need of encouragement and a reminder of God’s love. When I committed to blogging in January, I made a pinky promise with Heaven and set a goal that by TODAY, I’d share this life-giving, Jesus-loving gift with others. Thanks to God and Heaven-sent friends, I made it. I made the birthday and the box. Now that’s a gift. It’s pretty simple, but I’ll share the how-to’s and more pictures of how I put them together below. And when you subscribe to this blog, you’ll get a free download to print out assorted Bible verse cards and a gift card to place with your gifts for your very own box of Sonshine. Ask God to place someone on your heart who could use a special reminder of your love and His. I’m so blessed to celebrate the GIFT of friendship and SONshine with you TODAY! And finally, the box that’s been years in the making—literally. Months after my beloved friend passed away, I prayed for God to show me what I could do to keep the faith that He’d set ablaze in my heart alive, and to reveal how I could honor the gift of time spent with her while sharing His transforming love with others. I received His answer in verses He nearly plunked down from the sky. Right after that prayer-filled and tear-stained moment on Aug. 7, 2005, I opened my Bible to find the answer. The words lit up, hopped off the page, and landed in my lap. A Heavenly gift. And of all days, my calendar showed it was on Friendship Day. How do I know that? Because when God does the cool God stuff that only He can do, I check the date and jot it down. To remember on days like today. And to top it off, the next person I gave a Sonshine Box to sent me a thank you card in the mail with Bible verses canvasing the cover. That’s what we’re doing here. When we make Sonshine Boxes for others, we’re bringing our gifts. For them—and for Him. 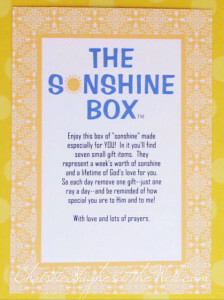 So when you’re hard pressed to think of a gift to give a friend or family member who needs uplifting, there’s no greater gift than a Sonshine Box filled up with love and God’s Word. Examples of times I’ve given them are when loved ones are going through: cancer and other physical illness, depression, loss, discouragement, loneliness, the challenges of being a single mom or a widow, as well as for Birthday blessing boxes, Christmas blessing boxes, and the list goes on. But you don’t need a reason to love—and you don’t need a reason to give. Just love. Just give. He’ll do the rest. *These are only a few examples of gift items you can include. 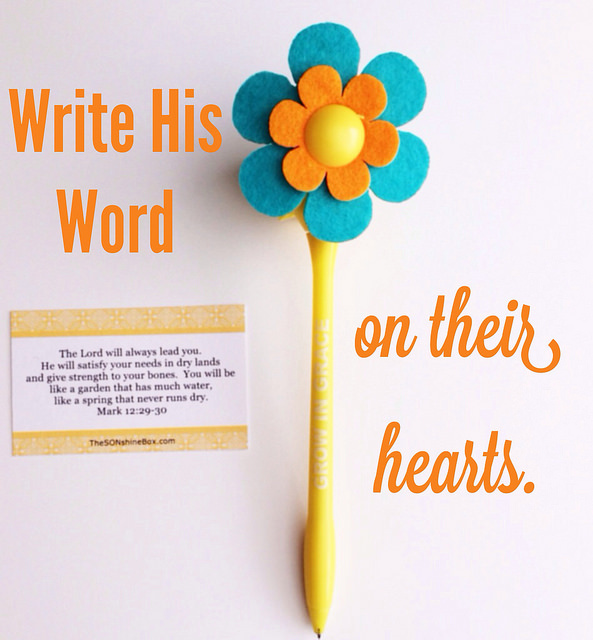 The key is selecting a bible verse that corresponds with each of the gifts. Examples of other gift items: lotion, bubble bath, nail file kit, coffee mug, etc. They can be simple and inexpensive items, but with His Word attached and your love thrown in, they’re priceless. Although I use picture boxes from craft stores to place the gifts in, my family member wraps empty shoeboxes with yellow wrapping paper, and keeps them on hand for the many times God’s prompted her heart to make one. Then you simply wrap each item in tissue paper or wrapping paper, tape your Bible verse card to each item, and you’re done. And when their week of unwrapping gifts is up, they’ve still got Bible verse cards–and His word–to hold onto forever. 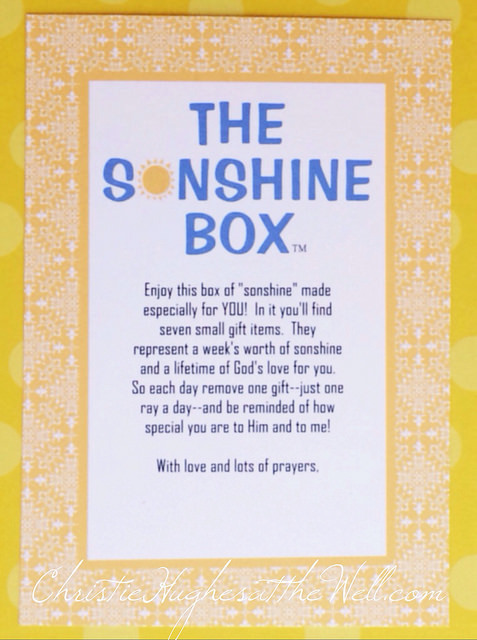 The free file you receive here includes the above gift card and 24 bible verse cards for you to print out and select from for your Sonshine Box. Print them onto card stock so they’re durable. And please, when you make and give your Sonshine Boxes, come back here and tell me all about it. It’ll make my heart leap for joy, and I already know the God stories you’ll have. I’ve prayed for them—and your answers are in the making. Please send me the Sonshine Box PDF Printable and add my name to receive a free subscription to the Women at the Well weekly newsletter.